DAKAR, Senegal - Oil is being stolen on an "industrial scale" in Nigeria, the world's 13th largest producer, and the country's politicians and security officials are among those profiting, according to a new report from a prominent British research group. Thieves steal an estimated average of 100,000 barrels a day, the report said; working in elaborate networks and protected by corrupted security officials, they tap into the huge and isolated network of pipes that crisscross the country's swampy southern Niger Delta region. The price of oil fluctuates, but a hypothetical per-barrel price of $100 would mean an annual loss of $3.65 billion. Oil closed at $107.28 per barrel on Thursday. Much of this oil winds up being exported globally, said the report, which was released Thursday by the London-based organization Chatham House. The problem has reached such proportions that major oil companies operating in Nigeria have recently complained that theft is cutting significantly into production. A similar report last year, commissioned by the Nigerian government but largely ignored, said that over the preceding decade, thieves had been stealing 6 percent to 30 percent of the country's daily production. "Hydrocarbon theft is a major source of loss of revenue to the Federal Republic here of Nigeria," said that report, prepared by the country's former top anticorruption official, Nuhu Ribadu. It described the problem then as an "emergency." The full extent of the country's larcenous ingenuity is on display in the oil thievery. There is "theft from tank farms, refinery storage tanks, jetties and ports," according to the Nigerian report. "Officials and private actors disguise theft through manipulation of meters and shipping documents." Small-scale pipeline tapping operations can easily be detected in short daytime trips into the swamps from the Niger Delta's population centers. Telltale plumes of smoke from illegal refining operations rise above the water. But more significant "bunkering," as oil theft is known here, involves siphoning oil from pipes on land or underwater, loading it onto small barges, then transferring it to bigger barges offshore in the Gulf of Guinea. Sometimes thieves use pipes up to 12 inches in diameter to tap the lines, according to Chatham House. Sometimes crude is stolen from export terminals. The Chatham House report underscored profiteering at high levels. 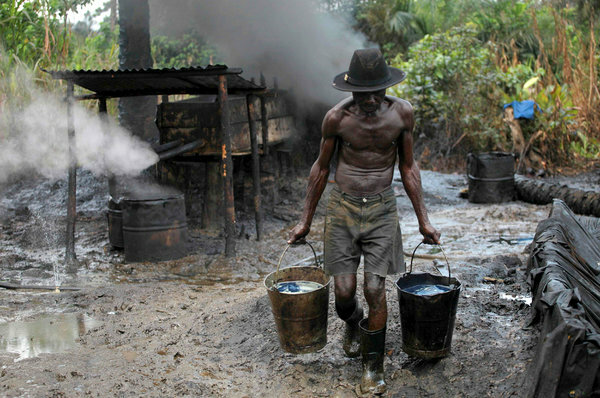 "Top Nigerian officials cut their teeth in the oil theft business during military rule," it said. "Over time, evidence surfaced that corrupt members of the security forces were actively involved. The country's return to democracy in 1999 then gave some civilian officials and political 'godfathers' more access to stolen oil." Security officials are said to extort payments from the oil thieves in return for protection, according to Chatham House. The Chatham House report suggested that high oil prices have contributed to the incentive to steal. But it was inconclusive on the question of how much of the stolen crude was exported, and how much was processed in operations in the Nigerian swamps. "The bush refining business is highly decentralized and secretive," it said, "which makes its size hard to estimate." Mr. Ribadu's report gave a higher possible figure for the scale of daily theft - 250,000 barrels - but the Chatham House document emphasized the unreliability of figures from government and oil companies. Mr. Ribadu suggested, in stronger terms than the more recent document, that the problem is growing, noting that Shell claimed a fivefold increase in losses between 2009 and 2012, from 10,000 barrels per day to 50,000 in March of last year. Chatham House, by contrast, said that "outsiders should look closely at claims that Nigeria is losing oil at unheard-of rates," adding that "the high divergence in industrywide estimates makes it hard to gauge trends reliably."